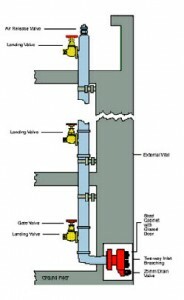 A dry riser is a vertical pipe or a system of pipes and valves that extend to the upper storeys of a multi-storey building. In case of fire, the Fire Brigade can connect their water supply directly to the riser, providing near-immediate access to water on all floors of the building. Dry risers are a highly effective way to deliver water quickly to a building’s higher storeys to control a fire. In Britain, dry riser installation is controlled by the 2000 Building (Minimum Standards) Regulations, which state their installation is mandatory in most buildings with floors over eighteen meters above ground level. British standards recommend that dry riser systems should be visually inspected every 6 months and tested once a year to ensure the equipment is ready for any emergency.